Jump on your hog and burn rubber as you chase the setting sun. Click here to play! Time to go cruising with your gang of buddies as you chase down the biggest cash jackpots on offer. 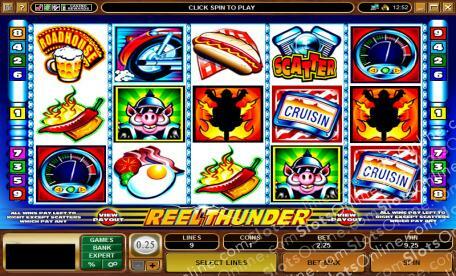 Reel Thunder is a breathtaking 5-reel slot played across 9 unique pay lines. The Wild Heart symbol can be substituted for any other symbol on the reels except Scatters in order to complete payouts. The most lucrative symbol on the reels is the Roadhog and he will pay out whenever two or more of him appear on active pay lines, up to 10,000 times your wager. The Scattered Engines can show up anywhere on the reels to earn you a payout, with up to 50 coins on offer on any line. The Reel Thunder is about to begin, so hop on your bike and start winning the big cash payouts today! The Scattered Engines can appear anywhere on the reels and multiply wins by the total number of credits staked. The Wild Heart symbol can become any other symbol except Scatters in order to complete winning combinations.